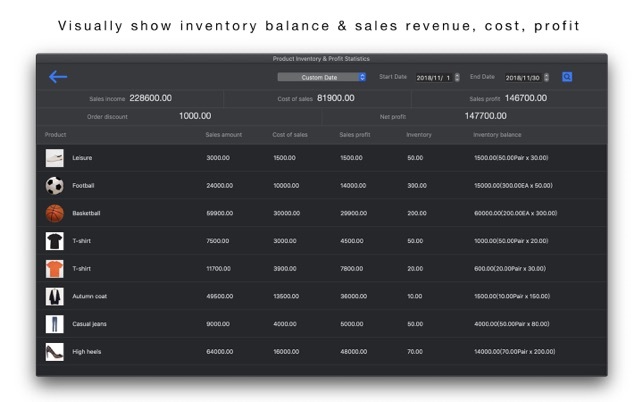 DailySalesPro (Invoicing Inventory Management) is an easy-to-use inventory management tool that keeps you up to date on inventory, sales revenue, purchasing and sales costs, and sales margins to increase capital efficiency and enable you to respond quickly to market changes. GET YOUR BUSINESS ORGANIZED !!! Suitable for wholesalers, retailers, and businessmen. - An order can add multiple products and calculate the total amount and cost of sales. - Inventory warning, keeping inventory safe. 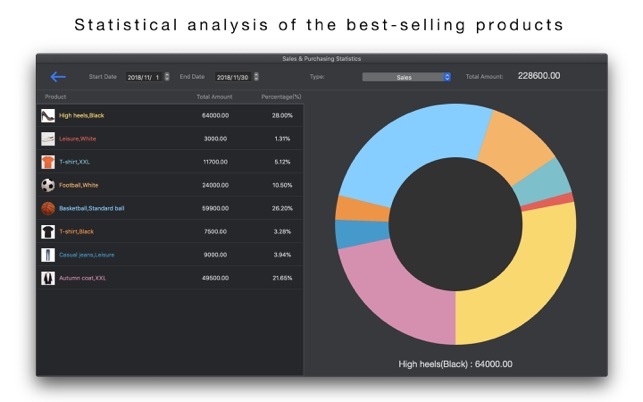 - You can set the highest inventory and lowest inventory for your product. - Custom product parent category. - Product subcategories are associated with product parent categories to quickly find products in different categories. - Product number format can be customized according to your needs. - You can view all orders associated with suppliers & customers at any time. 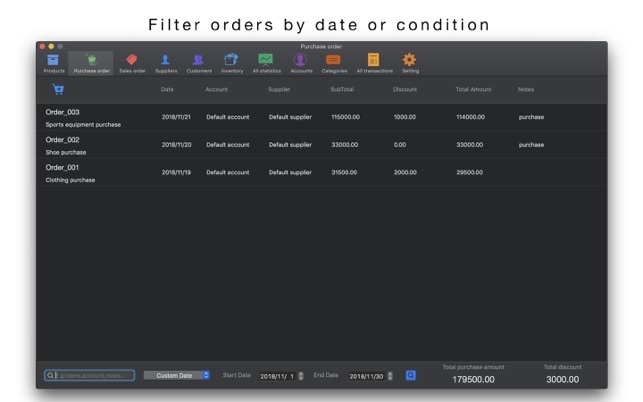 You can filter order records by two dates and make corresponding subtotals, discounts, total amounts, etc. - Business income and business expense management. - Customized revenue and expense categories. 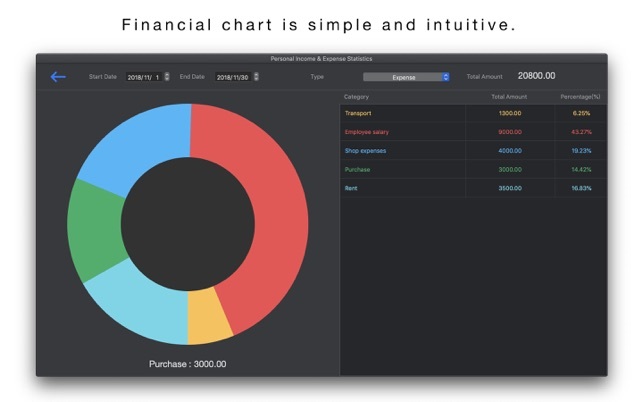 - Customized fund account, automatically counting the total revenue, total expenditure, total balance of each account. - You can view the transaction history associated with each account at any time, or you can select transaction data from two date ranges. 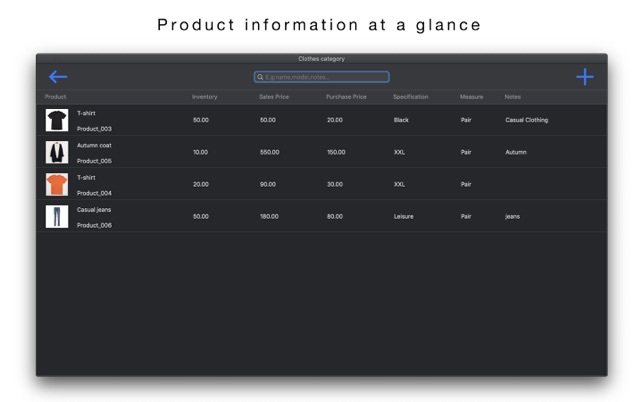 - Manage purchases and sales orders. - When adding an order, if the product inventory quantity is lower than the inventory warning, the system will remind you. 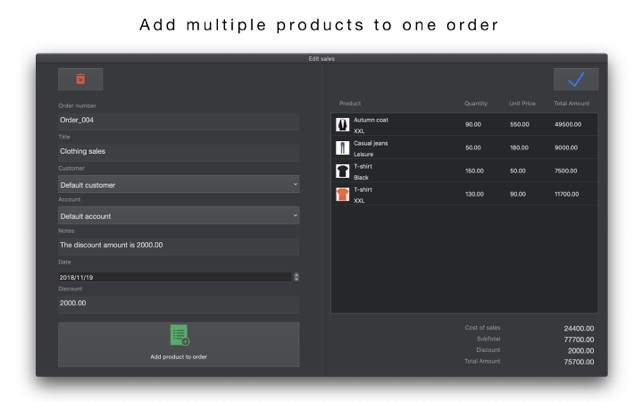 - Each order can add multiple products at a time, the products in the order can be modified or deleted from the order. - You can add a discount amount to each order, or you can add a note. - Title and order number can be added to each order, order number format can be customized according to your needs. 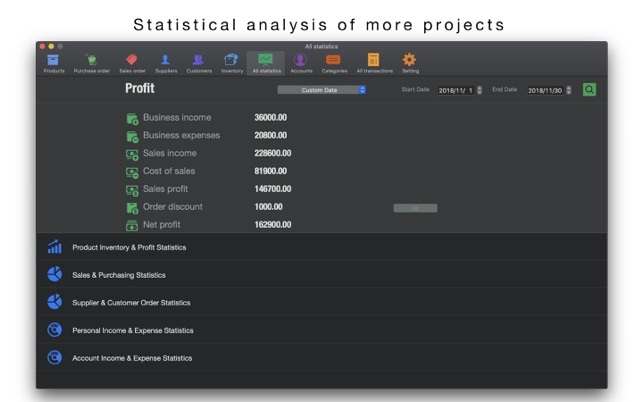 - Statistics include: profit statistics, business income, business expenses, sales revenue, cost of sales, sales profit, net profit, latest product inventory, sales amount, purchase amount, discount amount, etc. 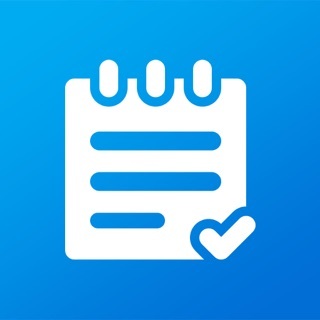 - Search for multiple conditions, quickly search for products, orders, accounts, specifications, categories, transaction records, suppliers, customers, etc. - You can view the history of all items by date (all, daily, weekly, monthly, yearly, custom date). - You can export CSV data for different items by date (all, custom date). - Password protected personal data (add, modify, verify). - System pre-set products, categories, specifications, units, accounts and payment members are available for quick selection. - Allow the entered amount to retain the last two decimal places (example: 19.99, 188.88). - Custom product number format (example: ABC_001, Product001). - Custom order number format (example: ABC20181013001, Order_20181013_001). If you have any questions about the use, you can contact us via email in the app and we will serve you better.